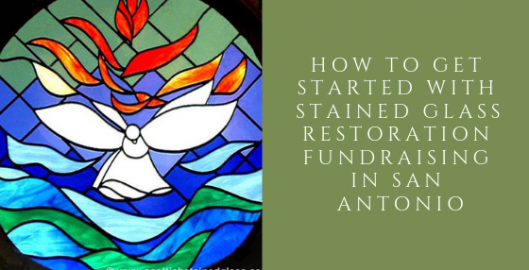 San Antonio churches are typically beginning the restoration process since most stained glass windows are within the 75-year to 100-year range. Restoration is a necessary process that ensures proper preservation of treasured, historic stained glass windows. In order to find the right stained glass contractor for your restoration process, it is important to ask the following questions. Having a good understanding of what to look for can drastically dictate the outcome of your project. When researching the right stained glass studio to undertake your restoration project, churches should always ask for the following: multiple references from past restoration jobs, portfolio items that are similar in size to your restoration project, as well as an on-site assessment. Stained glass contractors with in-depth experience in restoration should have no problem with complying with these requirements. 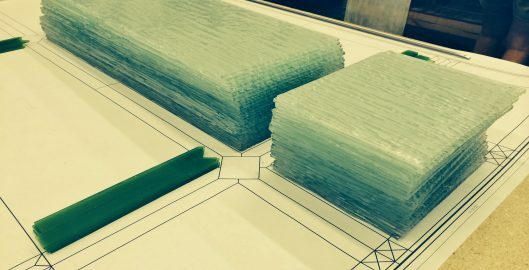 If you’re working with an insurance company and need to submit a claim, the right stained glass studio should have no problem with assisting in necessary claims materials. If a stained glass contractor says they can give you a project estimate without an on-site assessment, that is not a credible sign. Project estimates require an on-site assessment. This on-site assessment also analyzes what the underlying causes of deterioration are and is required to create a custom restoration plan. Stained Glass Installation from Stained Glass San Antonio from Stained Glass San Antonio on Vimeo. Once you’ve chosen the right stained glass contractor for your restoration project, it is important to understand that this is an extensive process that can take about one month per restored window. Your stained glass windows will also have to be removed from your church where temporary windows are installed to keep your church safe. For more information regarding stained glass restoration for your San Antonio church, please contact us! Our beautiful city of San Antonio is celebrated for its historic sights and landmarks, such as our churches and cathedrals full of vintage stained glass. Stained glass, or colored glass, immediately draws the eye to it and is one of the oldest art forms in the world. 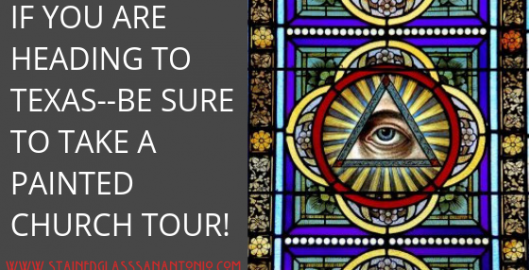 With such an important tradition to maintain, San Antonio churches have a great responsibility when it comes to their stained glass restoration. The first stained glass window dates back to 675 AD. In San Antonio, our oldest stained glass windows appear in The Chapel of the Incarnate Word, and they date back to the early 1900s. With glass over a hundred years old, it’s important to understand and respect this as an art form and not just as window filler. With proper respect comes proper care. When church stained glass restoration becomes necessary, only trained specialists should handle it. Until then, pay it the reverence you would an oil painting in a museum, because that is very similar to what it is. It is delicate and should be mostly left alone. Do not do unnecessary work to fading colors, scratches, cracks, or buckling. The interior of stained glass windows may get dirty over time, compromising the appearance of the window. Use a soft, dry brush to gently wipe away dust and imperfections, but do not use any harsh tools or materials. Anything other than light brushing can cause loss of detail or other damage. 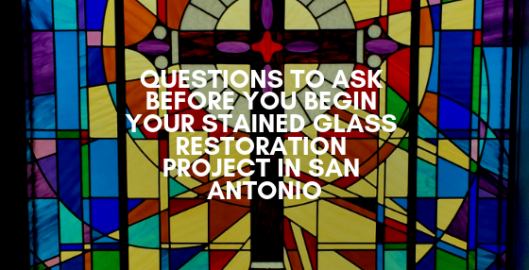 When you feel that it is time for church stained glass restoration at your San Antonio church, be sure to contact a specialist. Stained Glass San Antonio is an expert at vintage stained glass restoration. We are trained professionals and have years of experience handling the treasures that are stained glass windows. 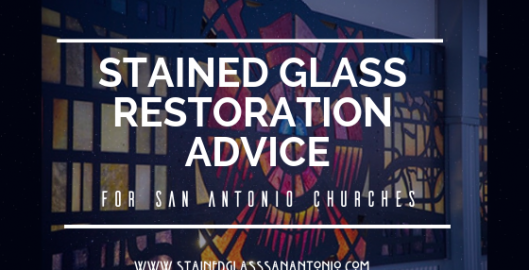 Give us a call today to and let us handle the very delicate task of restoring your San Antonio church’s stained glass. When visiting San Antion Texas a fantastic little activity is going to see the world renowned “Painted Churches”–the pride of many parts of the state. Painted churches are historic chapels, most of which were painted by German and Czech immigrants. As a way to celebrate their success and keep their spirits up, they use bright colors and bold patterns. Even better than visiting a single church is doing an entire tour. The Schulenburg Chamber of Commerce is known to be the best for this as reflected in their reviews and ratings online and well worth the $10 fee. As stained glass professionals here in Texas, we at Stained Glass San Antonio, can definitely appreciate the preservation of such amazing treasures which are a testament to Texas’ long and colorful history. In fact, we like it so much, we decided to write a little about the best churches included in the tour and the stained glass windows within them. This lovely old church is Nicknamed “The Pink Church” and was built in 1907. Technically it is the third church built on this site because both churches before it were destroyed by natural disasters. The current stained glass windows are simple, much simpler than the original ones that were destroyed but still breathtaking. The Saints Cyril and Methodius Church were designed by is the famous architect Leo Dielmann after the original church was destroyed in a hurricane in 1909. Dielman, as you may know, designed over 100 churches in Central Texas and it is easy to see why after visiting this painted church. The stained glass in Saints Cyril and Methodius is surrounded by some of the most beautiful interiors of almost any Texas painted church– characteristic of Dielman’s designs. St. Mary Catholic Church in High Hill has a brick exterior with a wooden interior which is different than most other churches in the area. The reason for this building style is that many were destroyed by storms and fires and brick/stone simply hold up better. St. Mary Catholic Church too was designed by famed church architect Leo Dielmann and was actually the first one he designed. Once again his Gothic Revival style is even evident by on the stained glass windows and painting on the ceiling. Here at Stained Glass San Antonio, we have repaired and restored quite a few churches similar to the amazing ones above. As restoration experts, we cherish the long church and stained glass history in the state of Texas and would love to work with your church if the need is there. For more information on stained glass repair or restoration in all of Texas, contact us today! 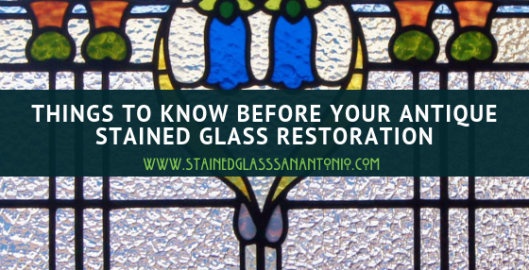 Once the decision has been made to get the stained glass in your San Antonio home restored– it is all gravy from there. Or can be–with the proper contractor and the proper steps to ensure things go smoothly. But happily, for you, the next step is essentially restoring your San Antonio homes stained glass to give it new life and luster for you to enjoy. As with many home restoration projects, this will involve workers in your homes and parts of your home that are off-limits for hours to days. Below we have outlined a few suggestions for your preparations based on questions we get and advice we give to our customers about preparing for a home improvement project. We are often asked whether one should stay or leave during a restoration. And really, the answer is for the most part–stay. While stained glass restoration does involve deep cleaning and scrapping–most of the chemicals are gentle for homes and humans. In the cases when more in-depth repair work needs to be done, or harsh chemicals will be used, we will most likely be doing it offsite in our studio. Since stained glass is breakable (although, no more so than normal glass) and always runs the risk of glass pieces where they shouldn’t be– you will want the area to be completely clear so your stained glass restoration specialist can maneuver as easy as possible. Also, take the time to clear off all ledges, shelves and, especially stairs. Make sure you to look around the area of the restoration ahead of time, move what you can out of the way and cover anything you cannot move. Although most of the cleaners we use for in-home restorations are mild–water stains are possible if things aren’t covered. Always make sure to keep kids and pets away from the work area–even gating them in separate rooms if possible. Things like ladders, buckets, dirty rags, and even loose glass are all items that could be laying around and be dangerous for children and animals–even adults too! Most importantly, if you have any question on stained glass restoration and/or crews, make sure to ask. 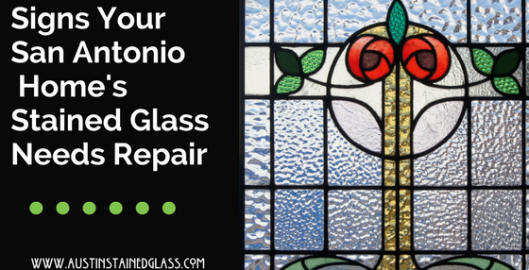 At Stained Glass San Antonio, we are happy to answer any questions before, during and even after we restore your San Antonio home’s stained glass. Contact us today for more information on stained glass restoration! Though stained glass has been around for quite some time, the movement gained most its popularity during the Middle Ages. However, in the 19th century, stained glass saw a revival, and this also happened again in the 20th century, when the movement spread to the US. As is such, many of the stained glass windows in the United States are now reaching a point where there are starting to deteriorate, calling the need for restoration. The historic stained glass features in San Antonio chapels are well known across the country. These antique stained glass panels showcase really powerful imagery that’s held sacred to many of the chapel goers that attend daily, weekly, monthly, and yearly. Religious stained glass has a way of touching hearts, inspiring, and relaying personal messages to congregation members. Enhancing stained glass is vital for both the worship experience as well as increasing chapel equity. Can I Clean The Stained Glass On My San Antonio Home Myself? 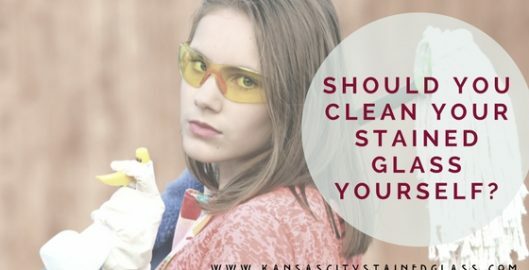 To find out when to clean your stained glass yourself and when to hire a professional, like Stained Glass San Antonio, read on! Stained glass is a very strong material, but, you really need to be careful when touching it or cleaning it. If your goal is just to get rid of some dust on your stained glass, then using a chemical-free duster and lightly sweeping away dust is fine. If your stained glass needs a bit more cleaning, you can use a simple dish soap and water to get rid of light grime. Be sure you are in a strong position, not on a ladder or windowsill, so you don’t fall into the glass and break it or hurt yourself. You clean stained glass by gently rubbing each pane of glass from the inside out with an upward, gentle, scoop-like motion. BE CAREFUL though and never scrub the glass. You likely want to go back through each piece with a wet soapless cloth to “rinse” any residue left on the glass from cleaning too. Like we mentioned before, stained glass can hold up fairly well but, caution is integral if you want your stained glass to have a long life. We feel, the best idea for stained glass cleaning is really, to just call a professional like Stained Glass San Antonio. Below are some reasons you absolutely need to call a professional. If you are ready to get your stained glass looking bright and new again but don’t want to deal with the hassle and inherent danger of cleaning it yourself, remember, there are experts to do it for you. Keep in mind also that a simple cleaning is much less expensive than an extensive repair should you damage your stained glass doing it yourself. 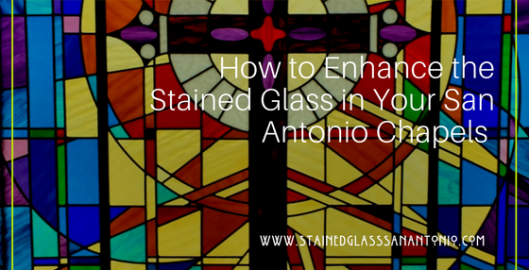 Contact Stained Glass San Antonio today for a free stained glass cleaning estimate! 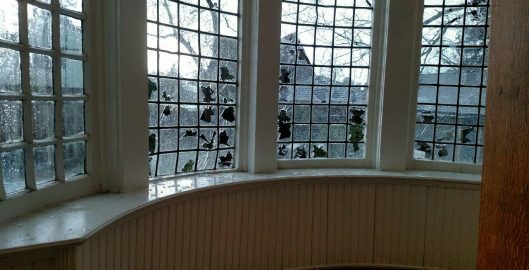 Has the recent hailstorm in Odessa got you reeling because of the damage to your stained glass windows? If so, you’re not alone. Dozens of homeowners and churches have been impacted by the damages caused by the storm. But don’t get too overwhelmed, because we have a solution to your stained glass hail damage problem. Stained Glass San Antonio offers stained glass repair for Odessa and the surrounding area as well as a variety of other services to help stained glass owners deal with the aftermath of the storm.